My husband and I attended our first Bar Mitzvah this weekend, for the son of dear friends. This was only my second time stepping foot in a temple, and I was nervous about feeling out of place or not understanding what was happening. I left the temple with a much greater appreciation for and understanding of the beautiful tradition of Bar Mitzvah. And I found myself wishing that Christian churches had a similar ceremony to accompany confirmation or other membership rites. 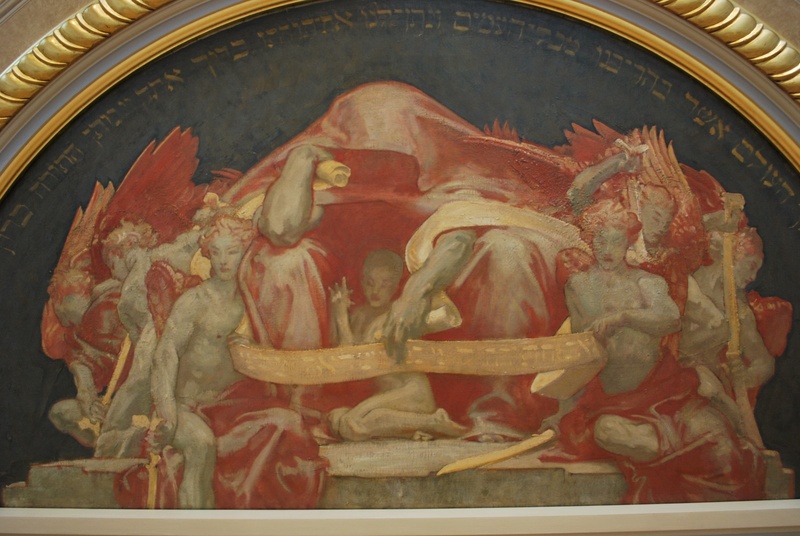 A detail of “Israel and the Law,” a study John Singer Sargent created for a mural in the Boston Public Library. In this image, Jehovah is instructing the boy Israel in reading the Torah. The first time I was in a temple, I was probably in eighth or ninth grade. My church youth group took a field trip to visit a nearby temple, and the place seemed dark and foreboding to me. I don’t remember much from that trip, although I was pleased – and a bit surprised – to be allowed in. Maybe this is how non-Christians feel when they enter a Christian church? The temple where the Bar Mitzvah was held this past weekend was bright and lovely and filled with gentle sunlight filtering in from the hot day outside. As we entered to take our seats, I noticed a mezuzah attached to one of the doors. Because I knew exactly what this was and exactly what it was for, I took a deep breath of relief: something I recognized. Something that made me feel less out of place. The cantor for the ceremony (akin to a liturgist in the Christian church) made us feel welcome, too, inviting us to sing a wordless song along with her. Her beautiful voice and encouraging demeanor made it impossible not to try, and she ushered us into the start of the Bar Mitzvah ceremony.